I joined the Mushroom Club partly to learn about mushrooms, and partly to hang out with cool people who geek out on mushrooms. With great anticipation I signed up for my first foray hunting for the elusive Morel. Along with about 20 amateur and professional mycologists, I spent a gorgeous April morning in the Appalachian woods, head down, eyes on the ground, searching. I should have known something was awry when our trip leader pointed out where we should go and then she went in the opposite direction. Mushroom hunters are notoriously secretive about their sites. After an hour and a half my little basket was still empty, and so were most of the baskets I looked into. I did discover a beautiful “Showy Orchid” which enabled the wildflower enthusiasts to get a bit geeky. We all gathered at a picnic table to compare notes and, our fearless leader appeared out of the woods with a little mesh bag full of plump brown morels. She claimed it was pure luck, but I suspect foul play. Next time I will follow her direction not her directions. The day (and my dinner) were saved by another club newbie who happened to be a professional mushroom grower. He had graduated from college with a degree in computer science, and a healthy appetite. With impressive ingenuity he built a mushroom lab and a growing area in his basement, complete with hydration sensing, computer powered watering systems. We stopped off at his house on the way home and he gave me a couple of huge clusters of Oyster Mushrooms and Lion’s Mane mushrooms. All day I had been asking how other folks like to cook their mushrooms. Most of these purists talked about a simple sauté with salt, pepper, and butter or olive oil. That’s great, but it ain’t dinner. I decided to take my sauté to another zone. The impressive Oysters and Lion’s Mane deserved it. I had some pizza dough and I could have assembled a regular pizza, but I wanted them to retain moisture. So I decided to make a Galette instead, folding the dough over most of the filling. Some duck fat, caramelized onions and ramp goat cheese rounded out the flavor of the mushrooms without hiding their subtle earthiness. Ultimately my new club membership seems totally worthwhile. Maybe next time I’ll make this Galette with the big basket of Morels I find, but if not I can always visit my new mushroom friend and buy from his high-tech basement. Use one tablespoon of fat to generously grease a sheet pan or pizza pan. Press pizza dough into a free form circle or rectangle 12-15 inches wide and about 1/8 inch thick. Melt remaining fat in a skillet and sauté the onions on medium low for about 20 minutes until they are soft and starting to brown. Meanwhile clean (with a towel or brush - not water) mushrooms and slice them into one inch chunks. Remove any tough stems mushrooms may have (stick those in the freezer to make mushroom stock). Add mushrooms to the pan with onion, salt and pepper. Sauté until mushrooms are soft and moisture has mostly evaporated. 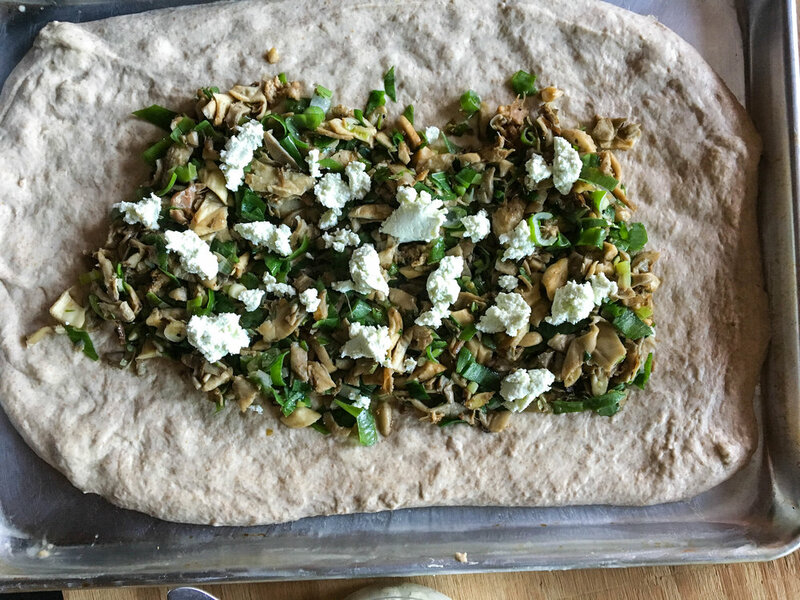 Spread mushroom mixture on top of dough – leaving about 2 inches of space around edges. Dot the goat cheese evenly on top of mushrooms. Fold dough in sections over the filling, overlapping each section so that filling is covered all the way around the edge but not in the middle. Bake in pre heated oven for about 25 minutes until crust is browned. Allow to cool on the pan a few minutes then remove to a cutting board and slice into pieces to serve alongside a simple salad.